Peshkopi (definite Albanian form: Peshkopia) is a town in Dibër County, northeastern Albania. At the 2015 local government reform it became a subdivision of the municipality Dibër. The population at the 2011 census was 13,251. It is located 187 kilometres (116 mi) away from Tirana, the capital of Albania, and 20 kilometres (12 mi) from the Macedonian border. It sits 651 metres (2,136 ft) above sea level. It is the capital of both the county (Albanian: qark) and district (Albanian: rreth) of Dibër. It is the only county capital in Albania that does not share its name with its county. Peshkopi lies east of the Black Drin river. The Drin valley is the lowest part of the district. Mineral ores such as chromium, sulphur, and marble have been discovered in the district. It is also an important industrial center in Albania, particularly in relation to the food industry. Peshkopi has a branch of Aleksandër Moisiu University, currently closed by order of the national Ministry of Education for alleged failure to meet standards. The region now known as Dibër was inhabited in pre-Christian times by the Illyrian tribe known to the Romans as Penestae, Πενέσται in Ancient Greek (Albanian: penestë). Italian forces invaded Albania in 1939, reaching Peshkopi on April 15. Albanian Communist partisans retook Peshkopi on September 9, 1943. The following October, the partisans defeated Balli Kombëtar forces in an armed battle for control of the city. In July 1944, German forces occupied the city, but were expelled later that same month. Fighting continued in the Dibër region until early September, leaving the Communist-dominated National Liberation Army (Albanian: Ushtria Nacionalçlirimtare) in control. The most important kind of tourism in the region is the mountain tourism, because of the hilly relief, and the big surface of forests. In the district of Dibra, lie two of the thirteen national parks in Albania, Lure Park, and Zall Gjoçaj Park, which offer mountain tourism in the winter and summer, including climbing, walking, skiing, trekking, picnics, hunting, sailing at the lakes of Lurë etc. There are sulfur baths in Dibra, which aim to alleviate health problems. The museum, located beside the general secondary school, houses a collection of local costumes, carpets, kitchen equipment and filigree jewelry, as well as a number of models of local architecture. Elez Isufi Boulevard is a pedestrian-only street lined with linden (Albanian: bli) trees. There are thermal mineral water springs (Albanian: llixha) in the vicinity of Peshkopi, which are a draw for seasonal tourism, primarily from within Albania, but also to a lesser extent from neighboring countries. They are located a short distance east of the city, upstream along the Bellova Creek. The main sport played in Peshkopi is football. The cities main team is KF Korabi Peshkopi and its home stadium is Korabi Stadium with a capacity of 6,000 spectators. The team currently plays in the Albanian First Division. They were runner-ups in the 1961, 2015–16 Albanian First Division going in to the Albanian Superliga. The football club plays its home games at the Korabi Stadium, which has a capacity of over 6,000 spectators, and the multidisciplinary club's home arena is the Bashkim Lala Sports Palace, which has a capacity of over 2,000 spectators. There are buses that can take you anywhere in Albania and other surrounding countries. There is no train line in Peshkopi but the nearest station is in Librazhd. Still there are no Trains active in Albania. The main road the will take you to Peshkopi is the SH6 (State Road 6). In the upcoming years the Arbër Highway will be complete. This highway will link Tirana, Albania with Debar, Macedonia and will connect with SH6. ^ Sinani, Rakip (2005). Dibra dhe dibranët në faqet e historisë [Dibër and the Dibrans in the Pages of History] (in Albanian). Tiranë: KTISTALINA-KH. p. 20. ISBN 99943-625-8-5. ^ a b Moisi Murra (January 2010). "Qyteti i Peshkopisë nga lashtësia në ditët tona" [The City of Peshkopi from Antiquity to the Present Day] (PDF). Rruga e Arbërit (in Albanian). p. 8. Archived (PDF) from the original on 2011-07-10. Retrieved 2010-02-15. ^ Sinani. p. 138. Missing or empty |title= (help). ^ "Blue Albania - We help you to explore Albania... - Portali me i madh turistik Shqiptar". BlueAlbania. Archived from the original on 21 July 2017. Retrieved 23 April 2018. 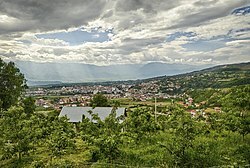 Wikimedia Commons has media related to Peshkopi.